July can be a slow month toward the beginning. During this lull, I make my pesto, then sit around and twiddle my thumbs a bit as I wait for tomatoes, red raspberries, bell peppers and corn. Before I know it, the lull has come and gone and I'm trying to get myself psyched for the chaos that often ensues come August. The tomatoes that are coming are finding there way into sandwiches and dinners, but there aren't enough to can. Yet. The corn, too, comes slowly (Jamey puts in several plantings). We have been eating corn on the cob with dinner, but the other day, there was enough to freeze a small batch. 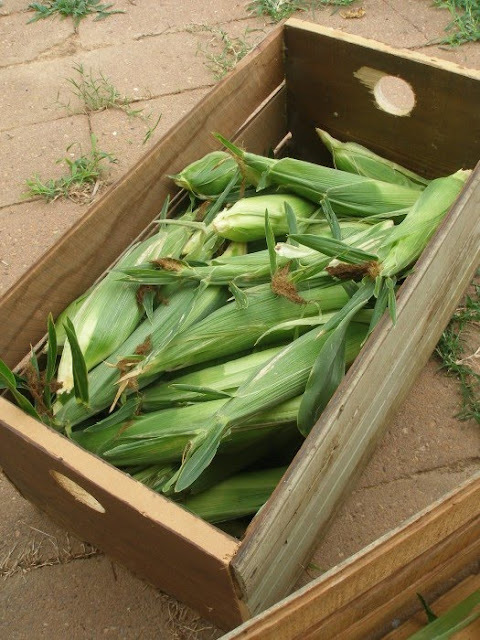 Click here for instructions on how to freeze corn. With those instructions comes our recipe for corn fritters (a huge hit with the kids as well as us). Have you seen this contraption before? 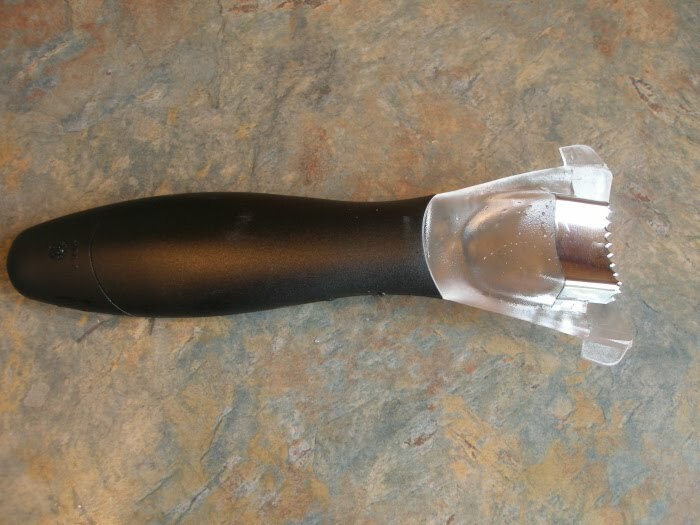 It's a handy corn cutting tool from Pampered Chef. I enjoy going to their parties to visit with friends, but I often struggle with the shopping part. First of all, I can't afford to be spending money on gadgets. And, I'm not big on gadgets anyway. BUT. 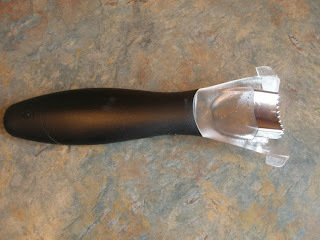 At the last party I went to, I came across this tool and thought it might be worth it. It is. It does an excellent job of cutting very close to the cob, so no juice is lost. The shield is effective in keeping juice and corn pieces from flying all over your kitchen. End of commercial. The other process that's been going on around here has been the curing, braiding and hanging of onions. Last year, our onion crop was small. The year before that was awesome (see last picture below). This year falls in between (about 110 onions). 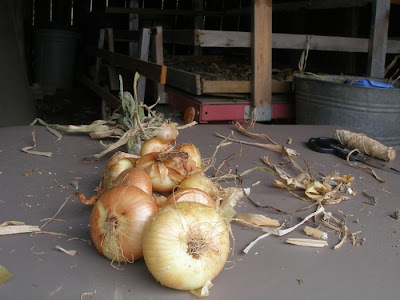 Jamey pulls the onions on a warm, dry day and spreads them out in the garden (on straw). They cure there for a couple days or until it looks like rain. Once the rain threatened, we moved them into a shed (spread out on our trailer) to cure for up to a week until the stems are mostly dried. Then, I braid them in the same way I braid garlic. They are messier braids because they won't be hanging in my kitchen. I put about 10 onions in each braid. If you braid many more than that, the braid can get too heavy. Once the braids are finished, we hang them in the barn where they stay until threat of frost. 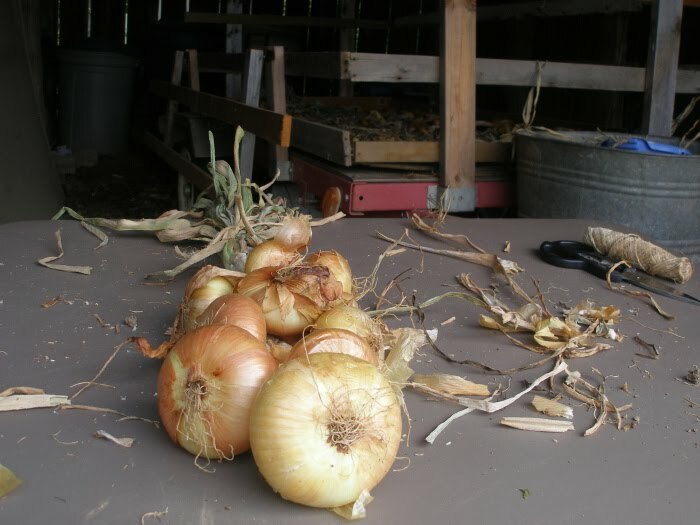 Then, we move them inside to a cool place (that won't freeze) and use them throughout the winter. 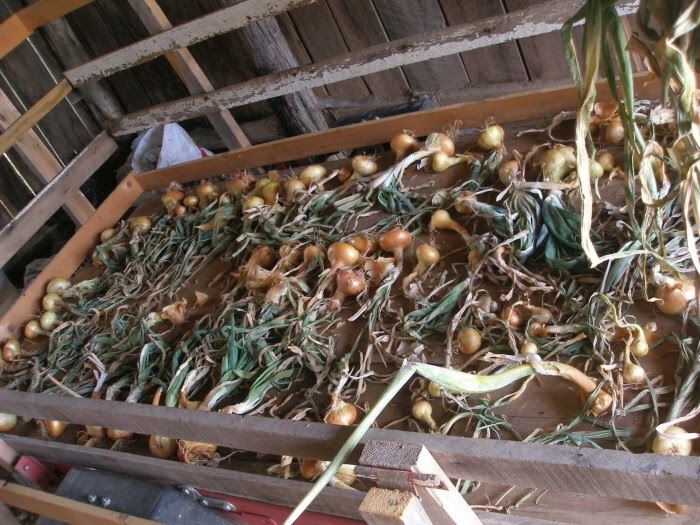 Our onion harvest two years ago. Looks so good, I can't believe the amount of onion you have! I think it may be a southern thing but would like to share how we cut/freeze corn in case you haven't tried it. You HAVE to try it! We cut it only half way into the kernel- you need a sharp knife. 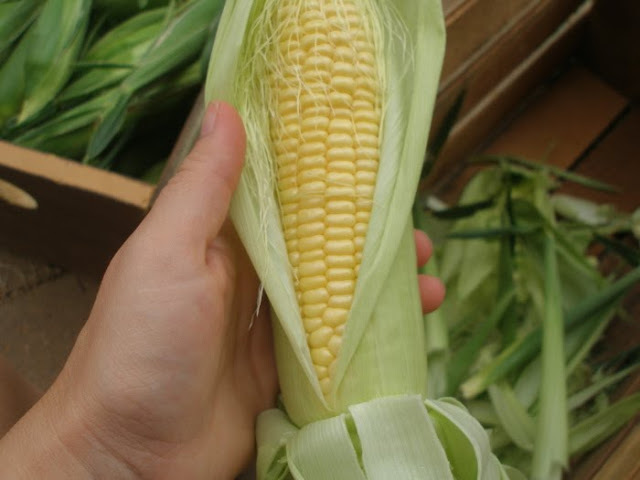 Then you take the blade of the knife and scrape along the cob and get all the pulp and juice out (which is called milking the cob) You freeze all this mixture of kernels,pulp,and corn milk in bags. You cook in an iron skillet- anything else and they send you up north. Now, traditionally you season the pan with bacon grease and cook some onion and then add the corn and salt and pepper- adding water if needed as it cooks about 18-20 minutes. I have not been adding the grease and have done it with just corn, salt, and pepper and I think it is still good and healthier. Southerner, It sounds like we do corn the exact same way (we only use salt and pepper, too) and I come from the north originally. I have to chalk-up my corn skills to my Mennonite heritage versus where I came from:-). The lull is definitely over . . . and your garden is ahead of mine! All of a sudden, there's too much to preserve, can, freeze. But that's so much of what gardening and summer time are all about, eh? I've never braided onions but just might give it a try this years. Yours are so attractive. You are a fount of practical knowledge! I'm so glad, because I'm horrified at all the farming knowledge lost in just a generation (my father grew up on a farm - I know very little). Margo, We braid our garlic and hang it in our kitchen and it survives the year just fine (I'm still using garlic braided last year). 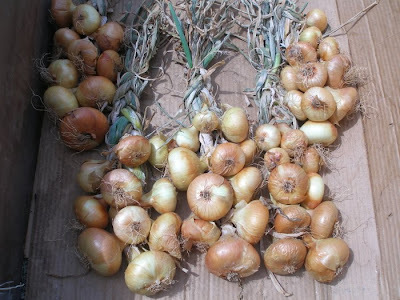 The bulbs that don't have stems attached (those that cannot be braided), we store in a paper bag (left open) in our pantry. Once I open a bulb and start taking cloves off, I keep the rest of the bulb in a glass ramekin (no lid) on my counter. That's just how we do it and it works just fine:-). Funny! I just told my kids the same thing. Hope they had fun because from here on out it's WORK!!!! 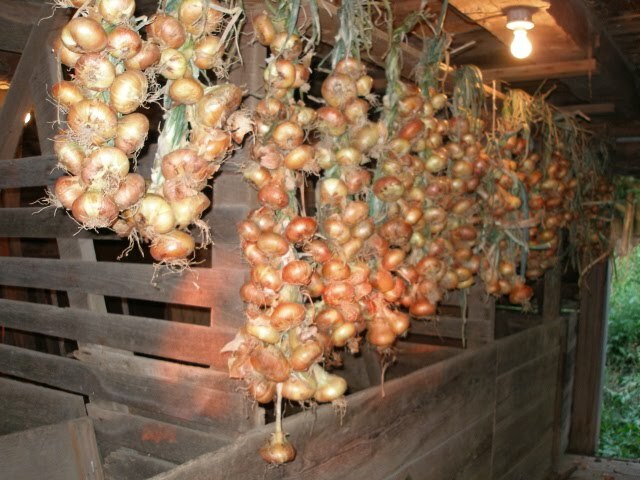 Maybe I will try braiding the onions this year, it certainly is a handy way to store them. 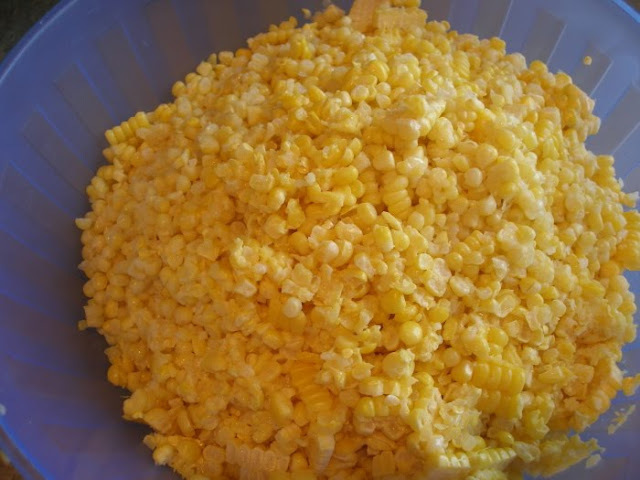 I just made a batch of freezer corn with my mother-in-law this weekend. It was my first time using the kernel cutter and it was definitely amazing - much quicker and more efficient than using a knife!